Where: Manhattan, New York, USA. Long story short: Characterful boutique property in Midtown curated by mysterious talisman. I’m arranging to meet an old friend who lives in New York. I’m there for the weekend. It’s a fair question, and one that I had no little curiosity about as I checked in. 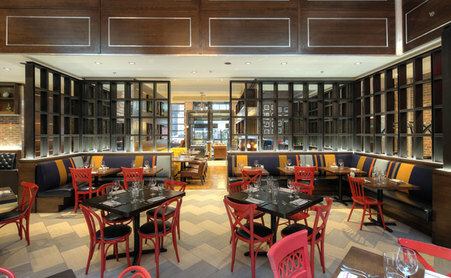 The new Archer Hotel is in Midtown Manhattan. The pre-publicity said that it wasn’t a hotel, it was a ‘personality’, which I felt had the potential to be incredibly annoying. ‘Personality’ hotels I’ve stayed in before had concierges that said things like “How may I enhance your vibe?” and, come on, nobody wants that. Thankfully, the reality is way more normal, and the mysterious Archer – played in the marketing literature like a nebulous, welcoming owner – isn’t referred to by the reception desk. I mean, none of them pretend s/he’s real. Although…they don’t deny it, either. In any case, even though the property has only been open a couple of weeks, the impeccably friendly team seem like old, comfortable hands. I am eagle-eyed at spotting hotel staff insincerity (hello, Ace Hotel) and there wasn’t one iota of it here. And they could have reason to be sniffy, being the only real boutique option in the neighbourhood, and a good 50% above the surrounding average room rates. But not a bit of it. It’s spanking new, but the tiling and dark woods of the lobby give it an old-school feel, and it feels very reassuringly New York, all confident and dapper. Archer, it turns out, was in my room all along. My standard room is a decent size (for Manhattan), with the kind of sleek retro fittings you’d expect from the lobby décor. Let's not linger on uneccessary detail here: it has the kind of comfy bed and great shower you’d expect from a $300+ a night boutique hotel, so all that’s fine. Here’s Archer, though, leaving me little notes. A fond welcome. Nods to the restaurant and the rooftop Spyglass Bar. I’m to make myself at home. Oh, here are some biscuits. Thanks, Archer. They have fortunes inside, from Archer: Sophistication is often simple. Remember why you started. Thanks, Archer. Archer becomes kind of real. I even have a voice for Archer. I’m not going to tell you what it is. I am weirdly reassured by Archer’s presence. Well, Archer’s non-presence. But Archer’s implied presence. I feel Archer has my back. On the second day, Archer gives me a pack of playing cards. Is Archer flirting? It’s hard to tell. I swear, we’re not going down the path of the movie Her (man falls in love with computer operating system) even though I imagine Archer being attractive, in a removed kind of way. I’ve never had the disembodied spirit of a hotel in my room before, and, reader, I kind of like it. I can’t spend ALL my time with Archer, though, and I persuade my friend to come to the hotel. Look, Midtown’s not all bad, I say. See? Empire State Building view from my window (I have hidden Archer’s notes, they are just for me), rooftop bar for an evening cocktail, classy restaurant that does a cracking gourmet burger that is even better because Archer has – I forgot to mention – slipped me some money in the form of Archer dollars that I can spend at my whim in the hotel. That’s right, Archer is my sugar hotel owner. So what? In short, it’s a much-needed shot of character to the former garment district, and in my opinion, letting Archer talk to the guests could have gone so wrong, but to me, it felt very right. A bit too right at times? That’s not for me to say. I will say that the Archer dollars were given to me no questions asked, and we left on very respectable terms. I stayed in Midtown Manhattan and - whisper it – I had fun. Champagne tastes: There's a 10th floor sanctuary called Archer's Den with a seating area and...maybe Archer reads you a bedtime story or something? Shandy Pockets: Spend your Archer dollars on a breakfast/brunch and you walk out with a weirdly great and cheap meal, which is SO not New York. Many strings to their bow.